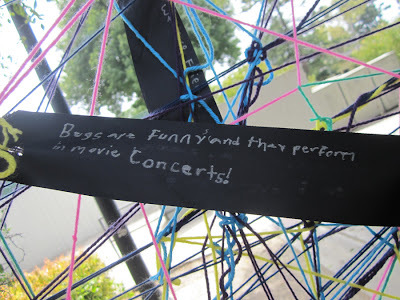 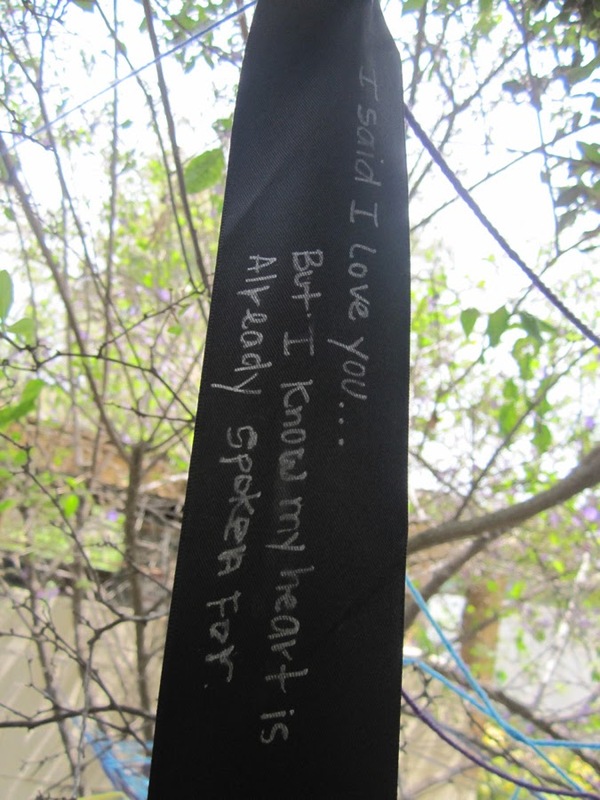 This project required that students work together in groups of four to create a site-specific installation that deals with the space, the environment and the location around the Ventura College campus. Topic suggestions were open to students interpretation. 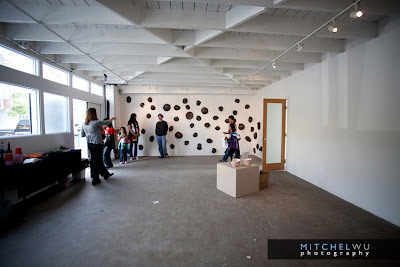 Here are the students work for Spring 2011. 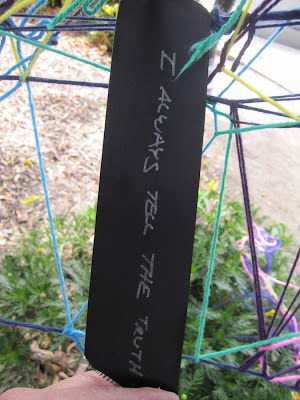 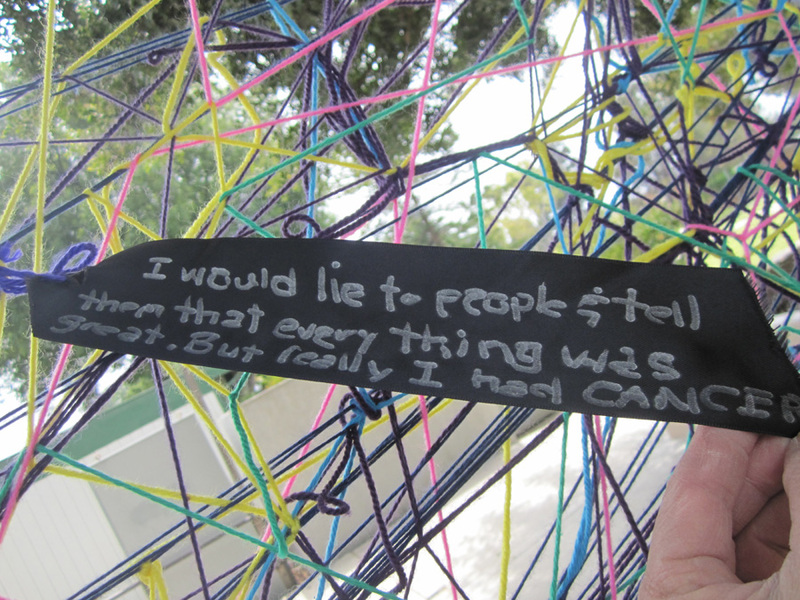 Artists: Austin Enoch, Katya Castro - "Web Of Lies"
Did you ever tell a lie? If you have, you should come by and unload your lies on the web that Austin and Katya had created. 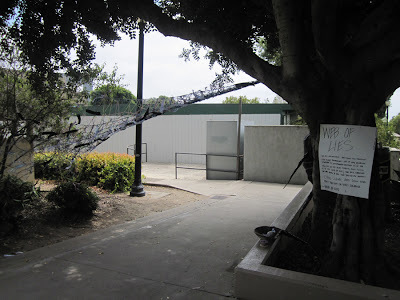 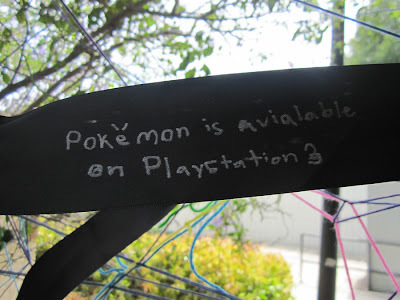 The web is located at Eastern Region of Campus walk way that channels to Art Building. This web has enjoyed an overwhelming response. Congratulations to both of you. 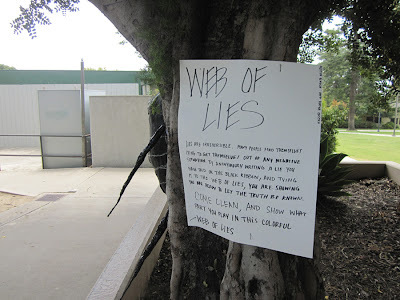 Here are some of lies the viewers shared. Detail - "Web of Lies"
Robert's installation wants to create an awareness and remembrance for all victims that died during war, natural disaster, or murder. 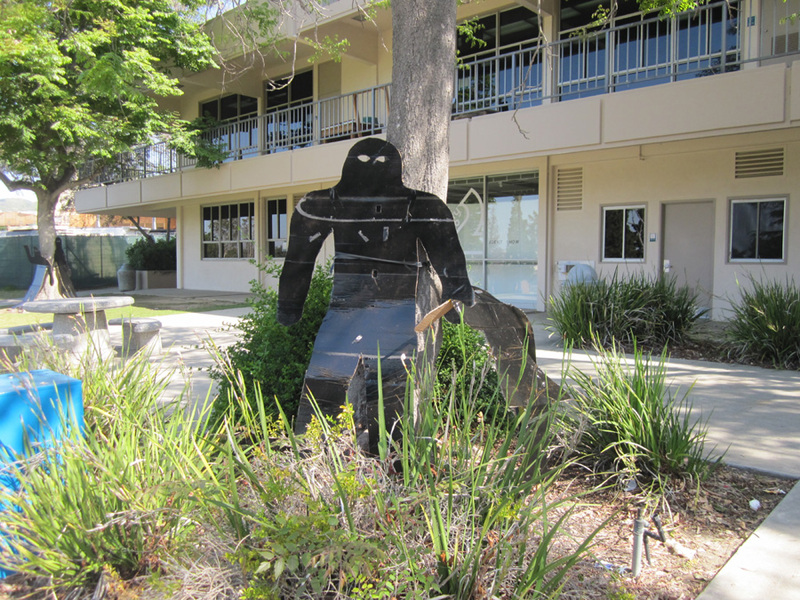 The artist created the black image cut out so the viewer can stand behind the sculpture and become a part of it. Artists: Rita McBride, April Mathewson, Norton Hatfield - "Progress"
The title "Progress" reflects how nature fights for survival with humans. 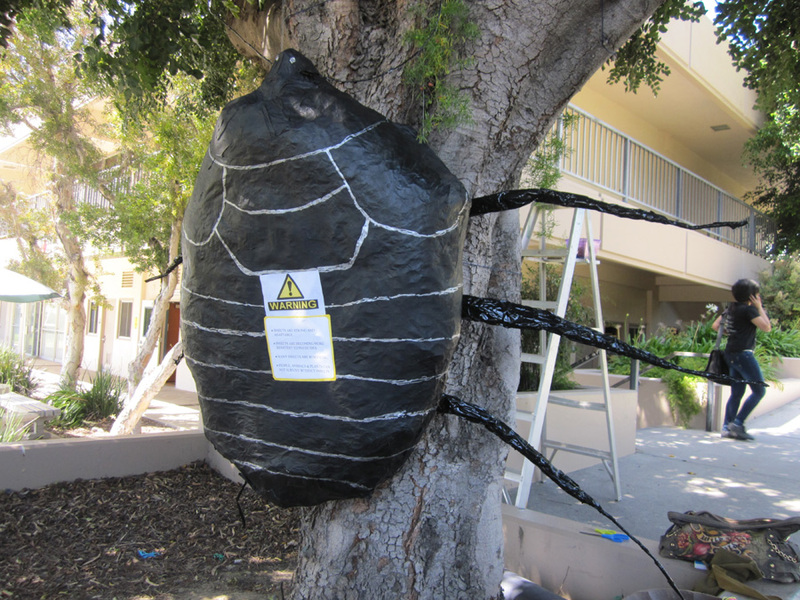 The markings on the tree hints at it being prepared for removal. 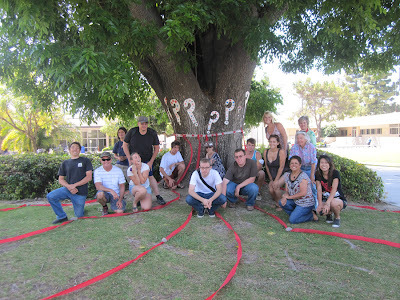 The red lines symbolizes bleeding and protests over construction, housing, and diminishing green spaces. Students picked the largest tree on the campus to install their concept. 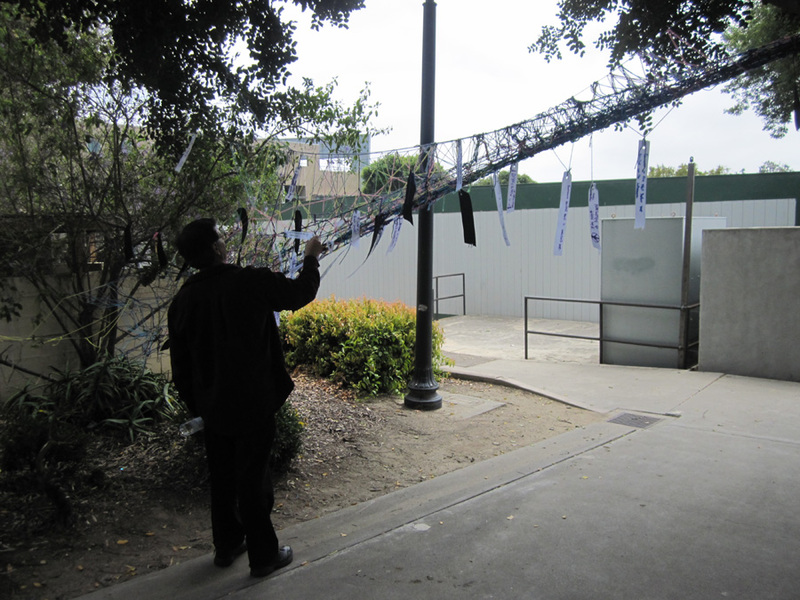 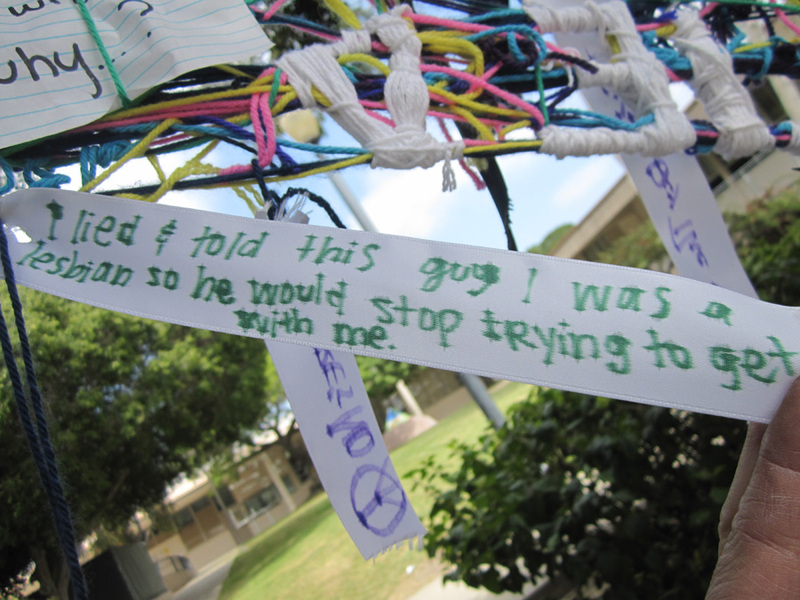 During the installation, students encountered anger, confusion, and concern from pedestrians passing by. 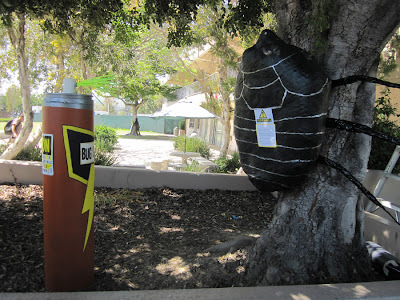 In this installation, students address the overuse of pesticides. The insect depicted has mutated and in response the pesticide has to become even larger and stronger. The oversize bug and spray effectively creates a phycological space between the object and viewers. 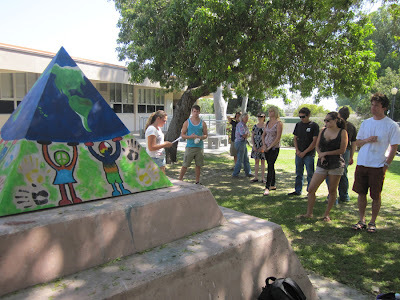 This group of students created the pyramid with graphics that show children holding up the world. 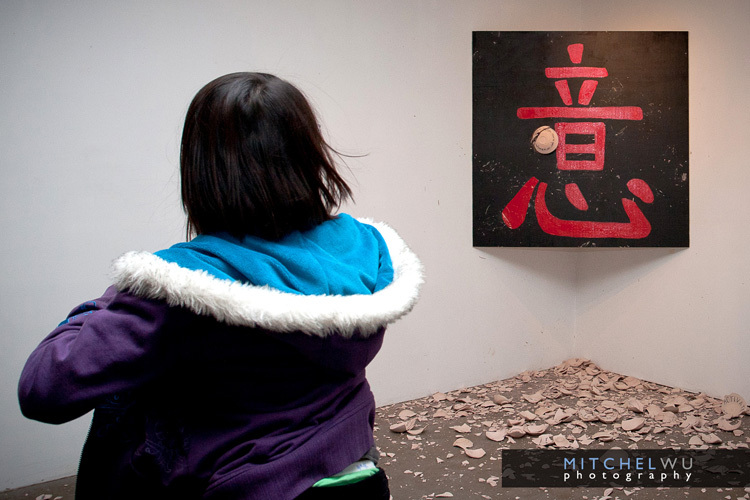 This symbolizes the that children of all races and genders are the foundation of our future. 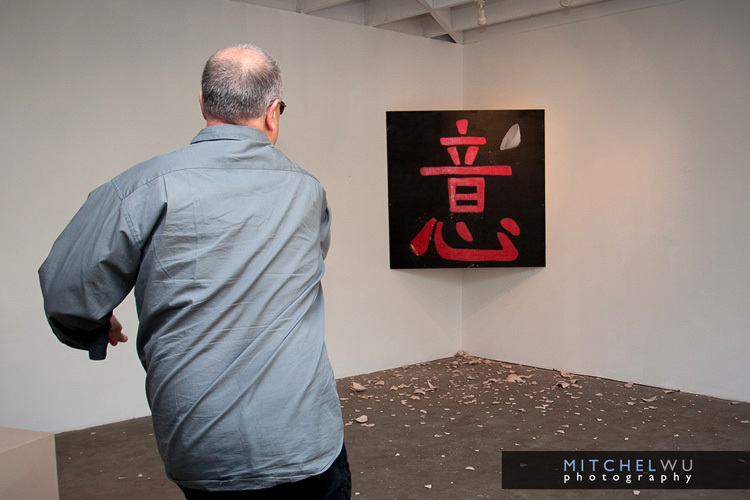 Some photos from Friday night's opening at the 643 Project Space Gallery in Ventura. 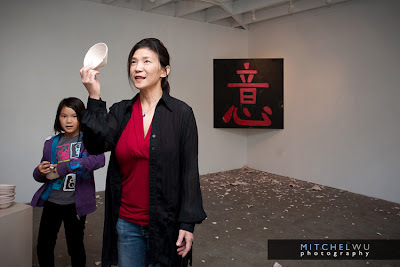 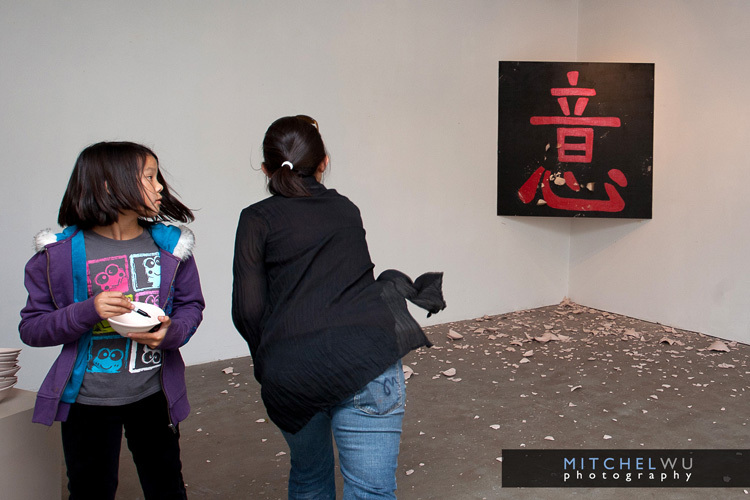 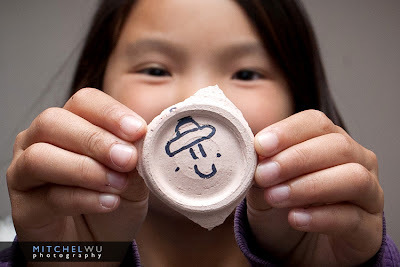 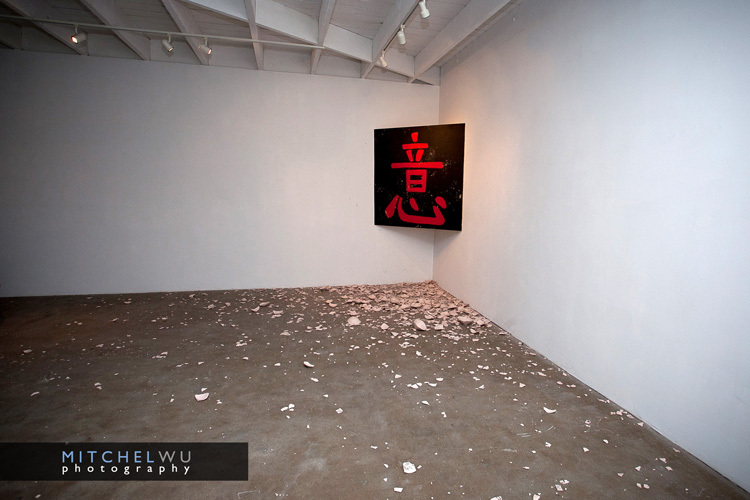 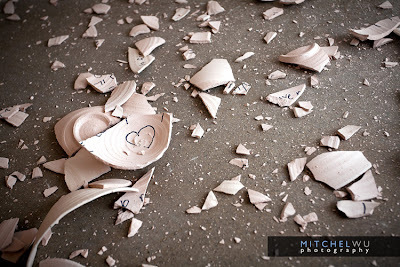 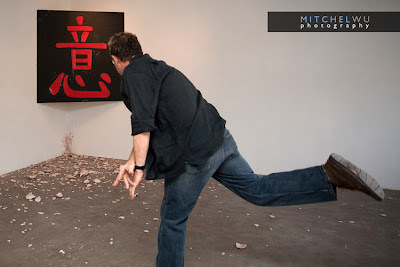 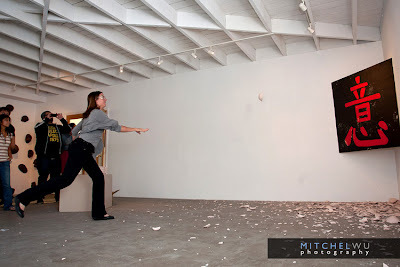 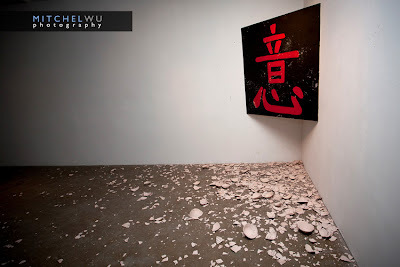 It is an interactive installation that invites viewers to write their wishes and hopes on a ceramic bowl, turn to a video camera and state their wish, and then heave the bowl at a painted Chinese symbol on the wall, shattering the bowl into a million pieces and thereby gaining a million wishes. 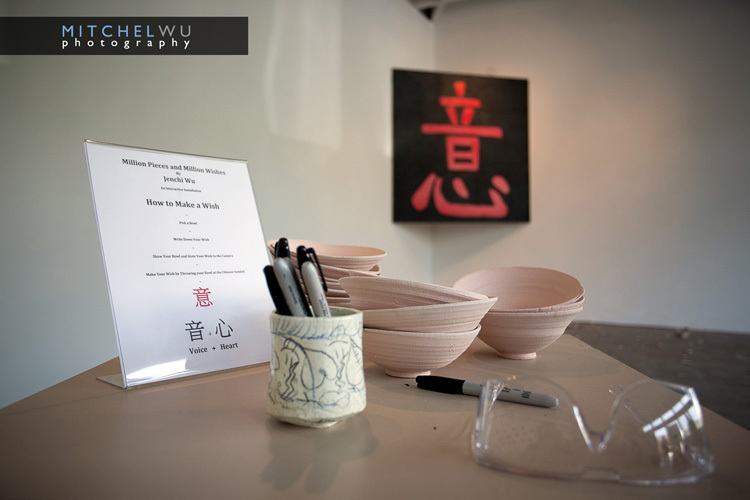 The saying came from the artist's Grandfather who used to own a shop in Taiwan that sold ceramic bowls. If the artist accidentally broke a bowl her Grandpa would smile and lovingly tell her "million pieces and million wishes." 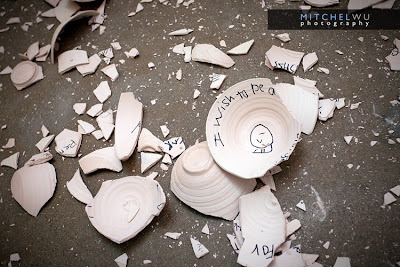 100+ bowls were thrown during the opening, which comes to 100 million wishes. Still a relatively clean gallery floor. 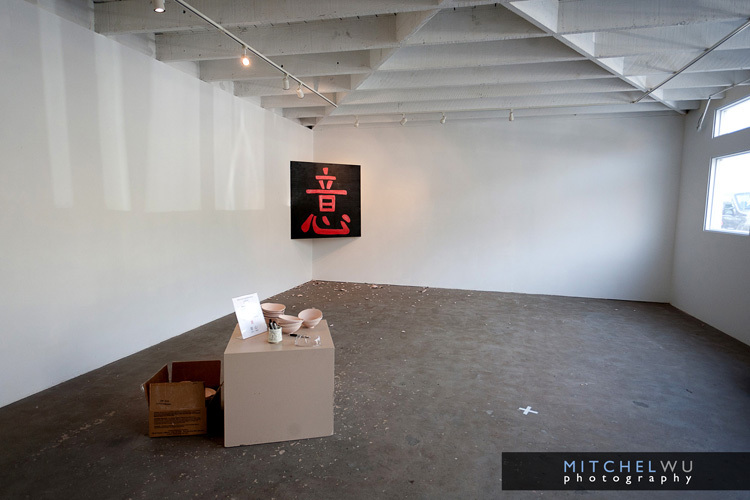 Project Space 643. Thank you Monica and Matt Furmanski. 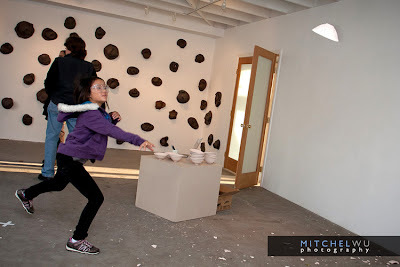 Ventura College Art Dept Chair and painter extraordinaire, Bob Moskowitz, can throw a bowl with the best of them. The lovely and talented Marjorie Moskowitz shares her wish before breaking her bowl into a million pieces. Jenchi states her wish to the video camera. 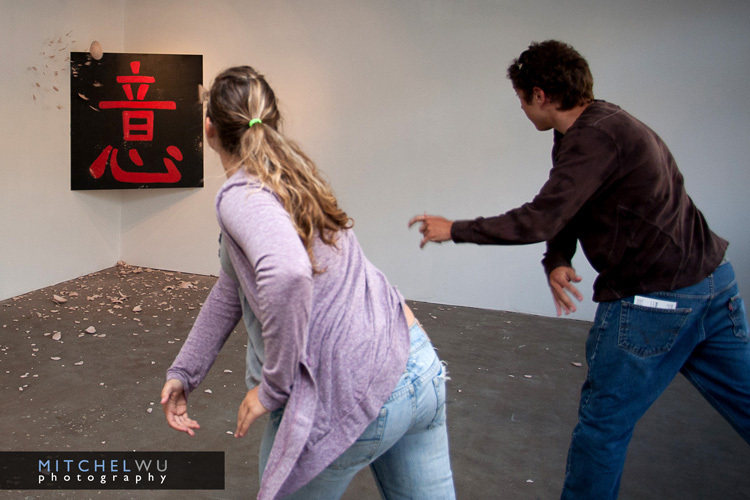 Artist and uber-talented Ventura College photography instructor Bill Hedricks pitches for a strike. 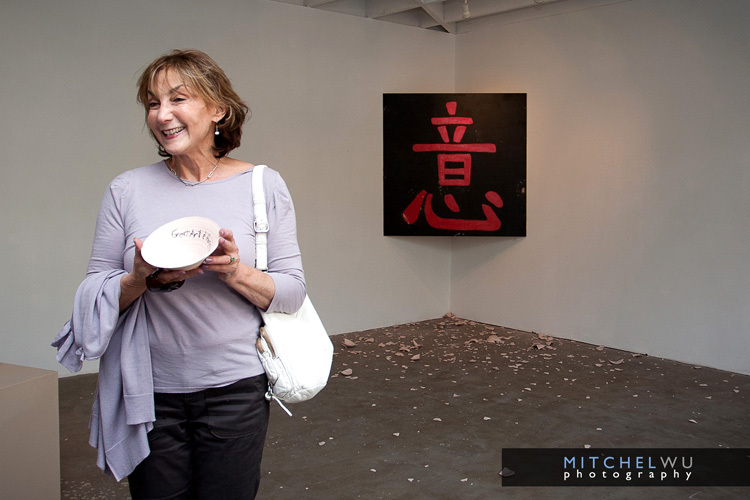 643 Project Space gallery owner Monica Furmanski about to claim one million wishes.